Ignore the title, it's just an allusion to a crazy friend of mine. Anyway, this post is another of a series of my silly copy-artist painting. 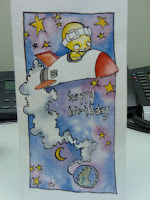 This birthday greeting is a straight copy of this and stems from my continued obsession with the cuddly Pon and Zi. So as usual, is the original and mine is the one on the right. Forgive the grainy image, it's from a cellphone. Done in watercolors and the outlines in Indian Ink. Indian Ink was good to use because it is waterproof and allowed me to finish the outline before starting on the colors. And I didn't have to worry about wet paint before working on the outline. but you weren't allowed to ask the question in the first place. Shameless plug: adding in this other copy-pasted painting of mine, albeit buggy and patched.